Hazelnut Coffee Cake is a yummy cake with a sweet meringue filling and will bring OHS and AH, whether it is served at breakfast, brunch or whenever. My daughter greatly impressed me when she served this delightful treat at a luncheon recently. If you are like most homemakers, you are busy and don't have tons of time for complicated recipes. 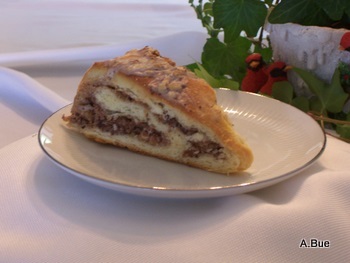 It's easy to manage your time with this recipe because you prepare the dough a day in advance with an electric mixer - keep the dough in the fridge overnight and bake this amazingly yummy Hazelnut Coffee Cake the next day. When you first glance at this recipe, you might think it's too complicated, but it is like anything you try for the first time. Once you read the recipe and understand the procedure, it's simple - of course, the second time you bake this cake, it's a breeze. This recipe makes two Hazelnut Coffee Cakes. ° In a small saucepan, heat ¾ cup milk to scalding. Remove from heat and let cool to a warm temperature. ° Sprinkle yeast over the warm water (100-110°) and stir until yeast is completely dissolved. ° In the largest bowl of your electric mixer, combine flour, ¾ cup sugar and salt. Work butter in with two forks or a pastry cutter until the mixture resembles that of cornmeal. ° Combine 3 lightly beaten egg yolks , scalded milk and yeasts mixture. Add this to flour mixture. Beat at medium speed (about 1 minute) until mixture is well blended and a soft dough forms. ° Divide the dough and shape and form into two balls. 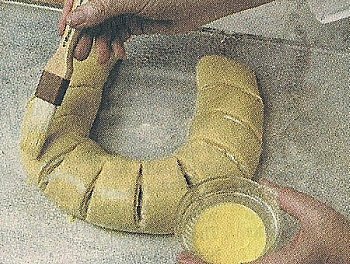 ° Place dough into individual buttered bowls, cover and refrigerate overnight. ° Remove dough from the refrigerator and leave at room temperature for 30 minutes. Heat oven to 350°F. ° While dough is standing, make meringue by beating 4 egg whites until light and foamy. Gradually beat in remaining 1 cup sugar until stiff peaks forms. Toward the end sprinkle cinnamon over mixture and fold in 1 cup chopped hazelnuts. ° Place one dough ball onto a lightly floured surface and form into an oval. Roll it out to a 10” X 18” rectangle. 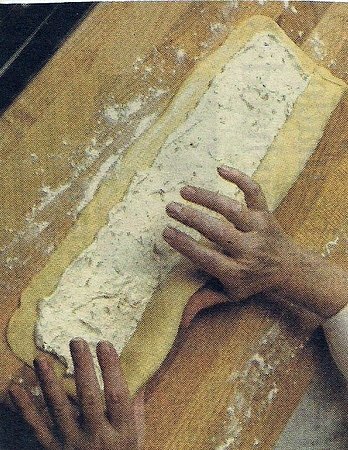 Spreading meringue over rolled out dough. ° Spread half of the meringue mixture onto the rectangle, leaving a 1” border. 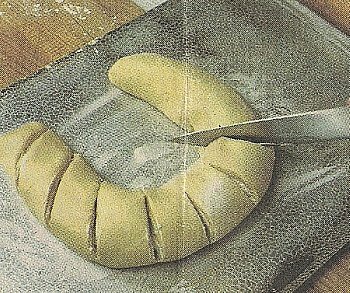 Roll up dough rectangle lengthwise jelly-roll style. 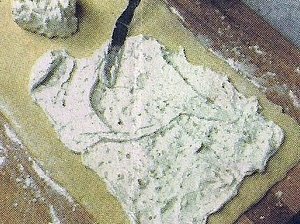 Seal by pinching the ends of the dough. Gently place the roll onto large, greased baking sheet, seam side down. Form into a horse shoe shape. Cut slats halfway through the dough at 2” intervals. Repeat process with the second dough-ball. ° Invert a large bowl over each of the cakes or cover well with a clean, moist cotton or linen dish towel and let the cakes rise for 45 minutes or until doubled. ° Lightly beat remaining egg yolk and 2 tablespoons milk. Brush entire surface of each cake with egg wash, but DO NOT brush the the meringue filling that shows through the slats. Bake for 30-35 minutes, until golden brown, turning the baking sheet halfway through the baking process. Cool for 5 minutes on the baking sheet before glazing. Drizzle glaze over coffee cakes. Sprinkle cakes with remaining ½ cup chopped hazelnuts.